No one noticed the mistake until the morning after the sign was installed above Interstate 710 in Southern California. A subcontractor had misspelled Olympic Boulevard. An "I'' was used in place of the "Y." The large green exit sign was covered with a tarp and eventually removed but not before drivers snapped and tweeted photographs of the mega-typo. The subcontractor will pay for a new sign. It is one of many improvements underway on the freeway as part of a pavement rehabilitation project. Critical thinking challenge: Why was the sign covered before it was removed? It would be super embarrassing to forget one of the letters from Olympics, and a bunch of people saw it when driving on the freeway. It would be all over the internet too. They covered the sign before anybody could take pictures of it and post it to the web because it would make California look bad and the sign would be an embarrassment. i read the article "Everybody Makes Mistakes Even In California". 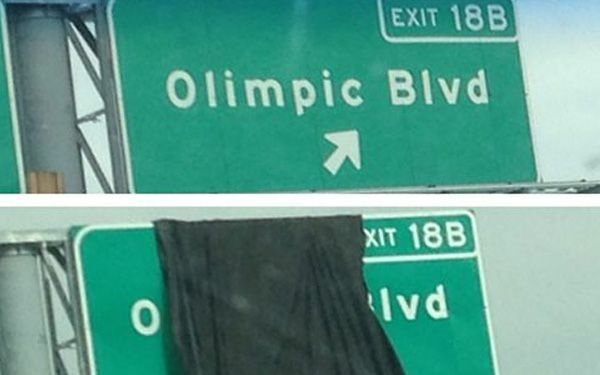 Nobody seemed to notice the mistake of the Olimpic Blvd sign. The subcontractor had misspelled Olympic Blvd by using an "I" instead of a "Y". The green exit sign is now covered with a tarp and eventually was removed. But drivers still got a pic of the sign. This is a really stupid mistake. I could spell Olympic in first grade. This article is about how a subcontractor had misspelled the word Olympic Boulevard on a sign above the freeway. He used an "I" in place of the"Y". Nobody noticed this typo for a while. When people started tweeting it, the person who misspelled it had to cover it up with a tarp until the sign can be replaced. I found this article good because everybody makes mistakes. This article is about how someone misspelled Olympic Boulevard. They put an "I" instead of a "Y." The people who made this mistake now have to pay for a new sign. Before the sign was removed, there was a tarp thrown over it to cover up the mistake. People were able to get pictures of the mistake before it was covered up and taken down though. I think that this article isn't that important but I think that this mess up is very funny. A sign in Southern California has been recreated due to its major typo. Olympic boulevard is a big area in Southern California but what I don't understand is why workers threw a tarp over the sign. Although embarrassing the sign can still register in people's mind as the correct street. I think the decision to cover the sign was a bad idea and that the company should've kept the sign up to benefit drivers as much as possible . The sign was covered before it was removed because they probably didn't have time or the priority of doing it right away, so they probably just covered it until they could fix it. 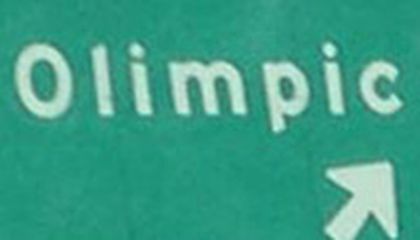 The sign marking the exit for Olympic Blvd was spelled incorrectly. No one noticed until after the installment of the sign. The spelling "Olimpic"was covered with a tarp until the subcontractor payed for, and installed, a new one. I think this is really funny because a professional company misspelled a street name on a public sign. Everyone makes mistakes, this one just happened to be public.